CTET Recruitment 2019 - CTET invites Online applications for recruitment of Teacher Posts. The applicants are requested to apply online only through Official Website http://cbse.nic.in/ on or before 05.03.2019. Interested candidates are requested to peruse the advertisement regarding the process of Examinations and Interview, Eligibility Criteria, Application Fee, How to Apply, Pattern of Examination, Syllabus, Question Paper, Admit Date, Exam Date, Result Date etc,. Refer thoroughly before applying. Last date for payment of fee through Echallan or Debit/Credit Card by the candidate. Declaration of Results on or before. Within 06 (Six) weeks from the date of conduct of the examination. Downloaded Admit Card and valid ID Proof (any of the following) documents such as “PAN Card, Aadhaar Card, Passport, Ration Card, Voter ID Card, Driving Licence and Pen etc. All rough work should be done in the Test Booklet only. The candidate should NOT do any rough work or put stray mark on the Answer Sheet. 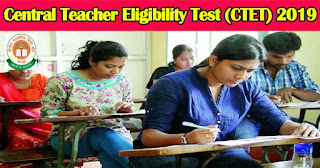 *In case confirmation page not generated, the candidate should approach the Joint Secretary (CTET), CTET Unit, CBSE between 10:00 A.M. to 5:00 P.M. from 14-03-2019 (Thursday) to 20-03-2019 (Wednesday) giving proof of the payment of fee either through Bank Challan or through Credit/Debit Card for considering his/her candidature for CTET - JULY-2019.